Even though we had been told that National Development would not submit an article for the multiplex, we decided to attend tonight’s Selectmens meeting to follow Ronald Regan’s motto of "Trust but verify". The selectmen closed the warrant for the April Town Meeting and it does NOT contain any articles dealing with a multiplex nor any articles submitted by National Development. There were a few posting today in the Patch and I responded with the following. "It is important to remember that we are first and foremost asking National Development to Honor the Agreement that they and approximately 1/3 of the town voters agreed to in 2007 that there would not be a cinema and that the maximum square feet is 395,000 sq ft.
Voting No on the cinema is an affirmation of that Agreement. Over the past six years, when we have approached the Board of Selectmen, Planning Board and other governmental bodies, we have been asked "Is it in writing", if it isn’t they can’t help you. The agreement is in writing and says no cinema and 395,000 sq st. Let’s Preserve Lynnfield." This is the text on Facebook. An image is also attached. We are committed to picking a cinema operator that best fits the Lynnfield community and our vision for a Town Center. We are still finalizing our provider and the details of our proposal and because of the brief window of time before April Town Meeting, we are asking Lynnfield voters to approve the addition of our Town Center Cinema at Fall Town Meeting on October 21st, 2013. For more information, please see the attached letter from Ted Tye. 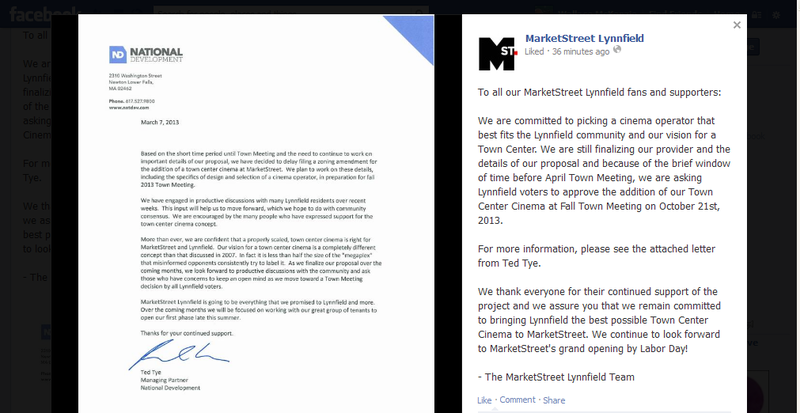 We thank everyone for their continued support of the project and we assure you that we remain committed to bringing Lynnfield the best possible Town Center Cinema to MarketStreet. We continue to look forward to MarketStreet’s grand opening by Labor Day!